Tires are everywhere you look. During a survival situation, the ability to fix a tire and extend its life is a good skill to have. The supplies in this article are inexpensive and can be bought a little at a time so it is not hard to fit into even a modest prepper budget. To be honest, these are things you should probably have on hand even during good times if you have any vehicles or machines at all. During SHTF, getting a new set of tires may not be a possibility. This means that extending the life of what you have is going to be the new reality. Even if you are just using small machines or wheelbarrows, tires are going to be part of your life. Rolling firewood along in a wheelbarrow means less work and strain then if you are having to carry all that by hand. Tires can make or break the deal. Making yourself useful during a crisis can make it a lot more likely that you will come out ok in the end. Tire repair is a skill that is not incredibly hard to learn but it sure is valuable to everyone. If you have some extra supplies on hand, you can be a major benefit to those around you. Even if everyone starts out with tires that are in good shape, it only takes one sharp object to make a vehicle, machine, or tool, unusable. Would you be able to take care of a basic tire issue if you were stuck with a flat?There are plenty of people that just figure they will call AAA to take care of it. That is fine if you are somewhere with a cell signal or when services are not being stressed. Staying on the side of the road for hours waiting when you could fix it yourself in 20 minutes doesn’t make a lot of sense if it is something minor. This toxic looking substance is great for making tires last longer. It is actually an excellent preventative measure you can take to prevent a leak from ever happening in the first place. While this is not an expensive item, you can definitely catch this stuff on sale or use coupons from auto stores to get it at a real bargain level price. It comes in quart and gallon sizes with the gallon being the most economical way to buy it. It takes a bit to do a large vehicle tire so having a gallon or two extra after you have reinforced your own tires is a good plan. Despite what it looks like, it cleans up well with water and repairs and seals tires for up to 2 years. 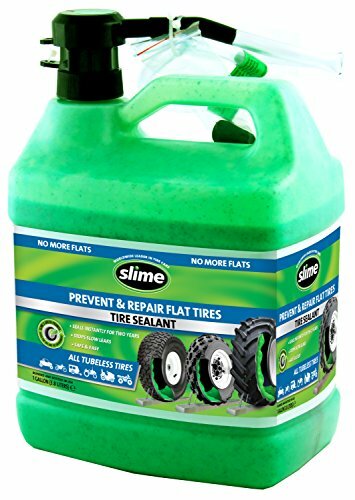 If your tires are still good by then you can put Slime in them again and keep going. Some household have more wheels than others. If you have a lot then it might take you some time to get all your tires sealed well. You first need to deflate your tire. When this is done, you pump the slime into the tire. The amount you need is based on your tire size and the chart on the bottle. You then inflate the tire. Your tires are now sealed and have an extra layer of leak and puncture prevention that will last the life of your tire! 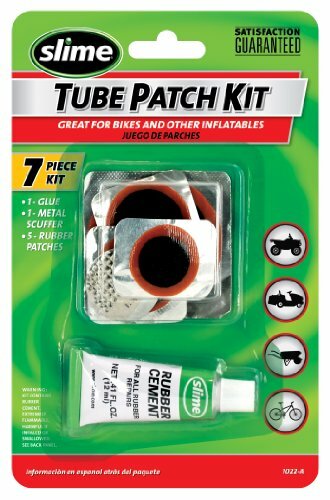 If you do get a puncture that goes all the way through, then you will want to reseal with slime again after the more major repair if there is enough tread left on the tire to make it worth it to repair. When holes are obvious or when they are large, you need to be able to plug the hole. This is the same thing they do when you get a repair done at a professional tire shop. It takes some time but it is not a repair that is out of the realm of skill for even those with no tire repair experience. 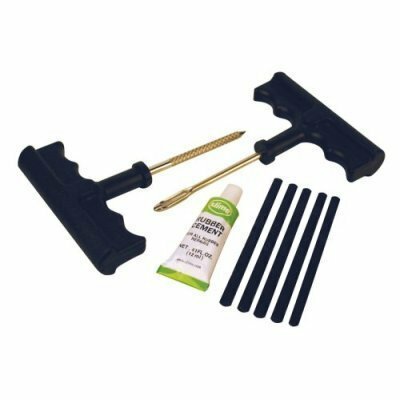 The kits are under $7 and you can get extra compound so you can reuse the included tools for many repairs. Having two sets of the tools is probably a good idea though just in case you drop or lose one. At this price point, it is not like you are making a huge investment. Here is the one area where you can pay a little or a lot and there are a ton of different options out there. No hand pump is going to be fast but in an emergency situation any pump is better than none. This being said, do not go out and buy the cheapest pump out there. This is the most expensive item mentioned in this article. If the grid is up, we just use an air compressor to fill tires at our place but if it were down it would be a challenge. There are 12 volt pumps you can get if you have solar power or some batteries. It takes a lot of pumping to inflate a bigger tire so if you can find a way to not do it by hand then that is a good thing. The pumps for car emergencies that are frequently sold are slow but you don’t have to hand pump so a little extra patience may be worth it. 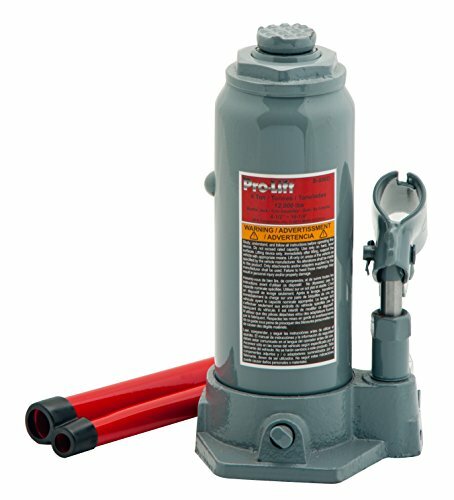 There are a lot of pumps out there so do some research and read some reviews before purchasing. You may just want to invest in several types to make life easier during different situations. Having one that works manually and one that is electric for example covers you in varying circumstances. 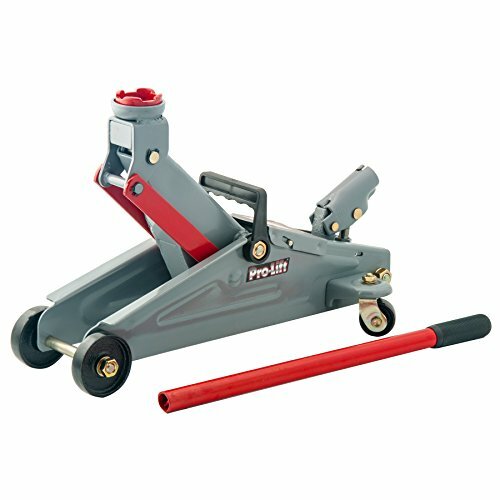 If a tire is attached to a vehicle or heavy tool then you are going to need a jack to do some repairs. In fact you may want to have several different types on hand. A lot of cars are sold with a small jack included but they are not always the greatest for all purpose use over time. A floor jack and a bottle jack puts you in a good position for all types of repairs and can be useful for a lot of other things around the home. The jack you choose is going to potentially be holding up a very heavy thing that you have to work around so this is another tool where you should not just buy the cheapest or lightest weight rating tool that you can find.